Ahhhhh, the old days. Remember when the venerable CPU was just that, a CPU? No cores, no threads, no multi-CPU servers. 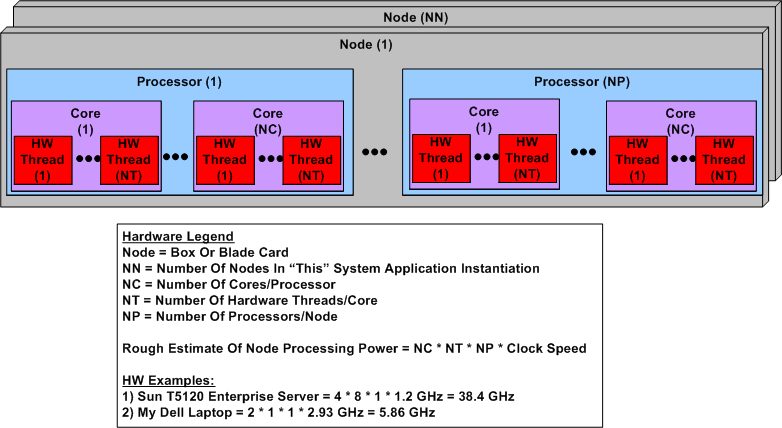 The figure below shows a simple model of a modern day symmetric multi-processor, multi-core, multi-thread server. I concocted this model to help myself understand the technology better and thought I would share it. 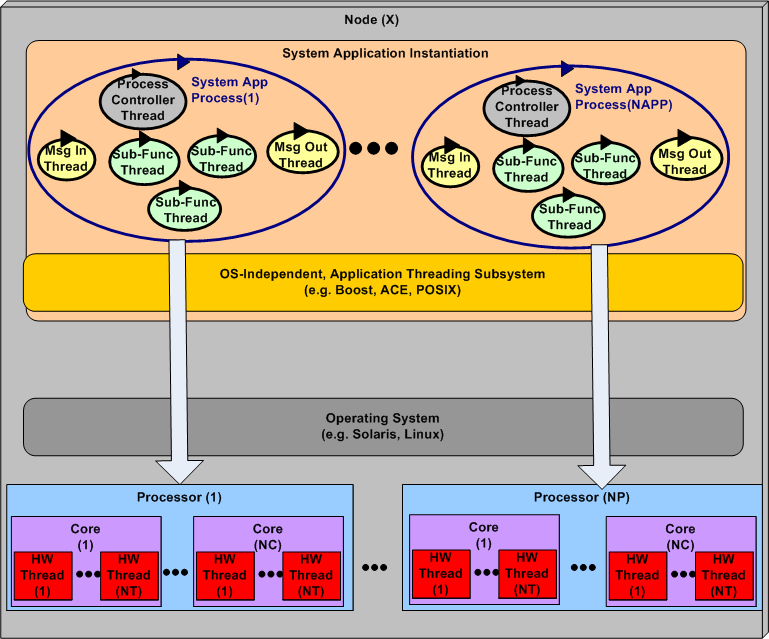 The figure below shows a generic model of a multi-process, multi-threaded, distributed, real-time software application system. Note that even though they’re not shown in the diagram, thread-to-thread and process-to-process interfaces abound. There is no total independence since the collection of running entities comprise an interconnected “system” designed for a purpose. Determining the number of hardware nodes (NN) required to handle anticipated peak input loads without dropping data because of a lack of processing power. The allocation of NAPP application processes to NN nodes (when NAPP > NN). The dynamic scheduling and dispatching of software processes and threads to hardware processors, cores, and threads within a node. The first two bullets above are under the full control of system designers, but not the third one. The integrated hardware/software figure below highlights the third bullet above. The vertical arrows don’t do justice to the software process-thread to hardware processor-core-thread scheduling challenge. Human control over these allocation activities is limited and subservient to the will of the particular operating system selected to run the application. 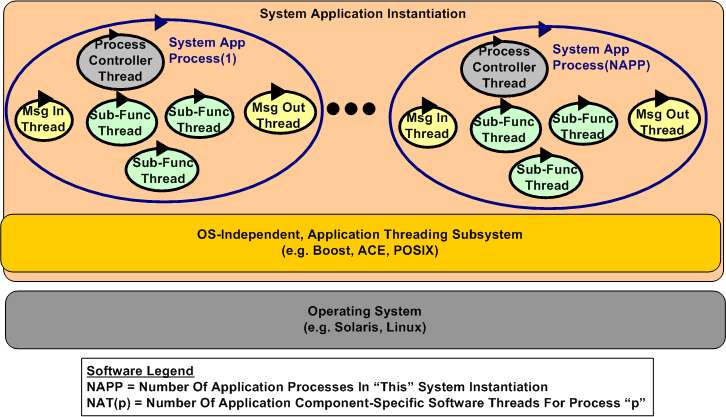 In most cases, setting process and thread priorities is the closest the designer can come to controlling system run-time behavior and performance. Very useful, thanks! but which of these different units (processor, cores, threads) share the same memory? Thanks Vivi. Processes run in their own address spaces. Threads run within a process’s address space, thus, they share memory. The sharing of memory among hardware components is tricky and beyond my expertise, but nodes in general don’t share memory.